What was your original inspiration for this project? How did it come to be? When I first saw the metallic knit at The Fabric Store in Sydney, I wanted to make a flowy tank or camisole, and save the scraps to make bindings for solid color knit dresses. Then, when The Fabric Store started up their online store, they offered to send some of their gorgeous merino knit, and I just knew it would make a perfect Mesa in this beautiful deep red shade. I also have some merino that I purchased in person there, in black and deep green. I might make more copies of this dress in the fall! How do you plan to wear it? 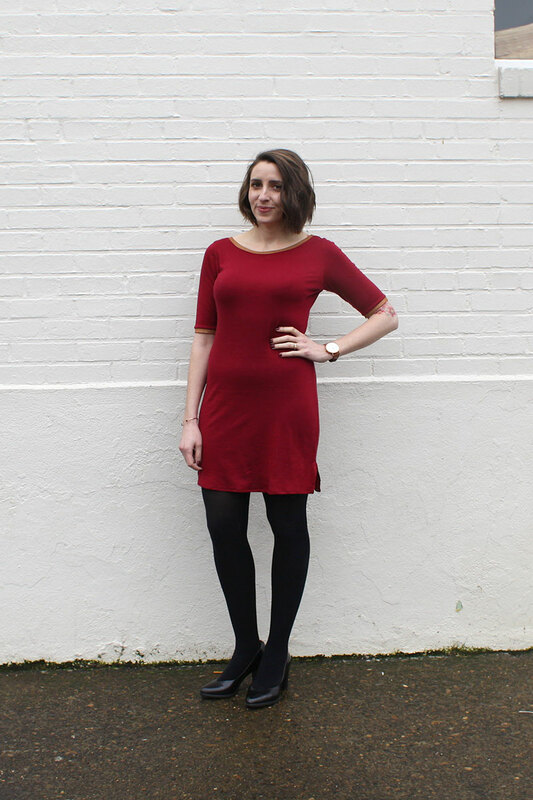 So far, I’ve been wearing it with black tights and flats a lot. It’s super comfy and warm. I LOVE merino knit. This dress is warm, soft, and makes me feel good. I’ll need a lot more of these soon. I also expected the metallic to be a little more spangly, but it’s actually pretty subtle. Making this dress that I love and have already worn a lot in about an hour. That feeling is the best! Fabric: Cotton/Linen, made by Japan’s Cosmo Textiles, here it in another color-way. I found the fabric at Bolt in Portland, Oregon and I fell in love. 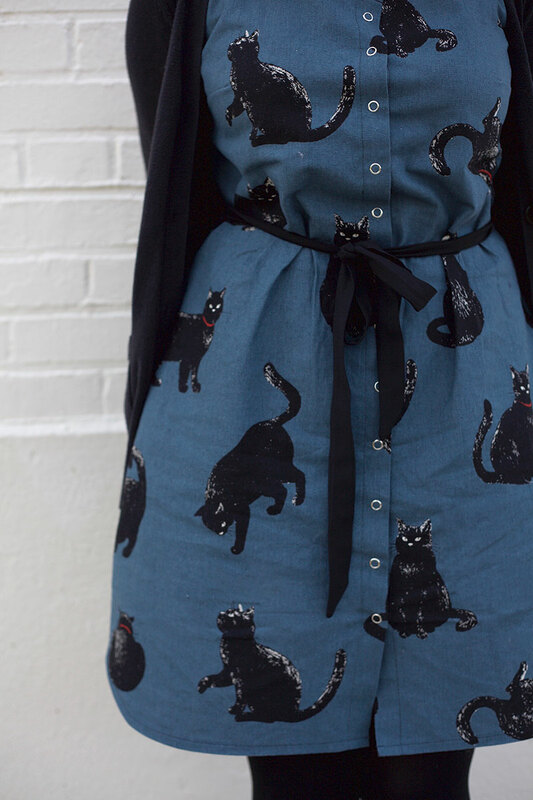 The cats on the fabric look just like my cat, Mingus. I just wanted the world to know how much of a crazy cat lady I truly am. I have also always loved the Adelaide dress and I wanted to make something that can easily transition from spring to summer. This was my first time sewing Adelaide, but that didn’t deter me from cutting straight into my fabric with my big 12″ Ginghers! It’s still a bit cold here in the Northwest, so for now I am pairing it with tights and a cardigan. As soon as the sun decides to grace us with it’s presence, I plan to wear it with sandals and maybe a skinny belt. You really do need that extra 1/4 yard when working with a print. I had to get creative with the cutting and that caused some changes with the hem at the side seams, but I do love the way it came out. I purchased only 2 yards of another fabric to make the same pattern again, so I know what to expect. I am proud of it all, but if I had to choose it would be the accidental curved hem at the side seams. I also couldn’t find any buttons so I used my handy dandy Snap Setter and had fun with a hammer. The snaps add subtle details where buttons could potentially overwhelm. Overall, it turned out rather cute. I think with my next Adelaide I will play with the neckline and maybe consider some fun trims and actual buttons! What have you been stitching up this month? Are you sewing for Spring yet? I love both of these. Yay for simple dresses! I love these! Especially your Mesa dress Sari! The color is stunning on you too. I love the cat dress, the pattern, the lucious fabric, how you handled the closure issue and the versatility. It would make a great tunic jacket over pants. Also you might unsnap the bottom snap, maybe the bottom two for a really casual and very stylish look. The dress would become a favorite “go to” in my closet. Thanks for sharing. I am a sixty four year old woman who recently took up sewing again. I am very influenced by Natalie Chanin’s work and am a fan of her website. I also look forward to your new patterns every month. I love the Lisbon-made two of them. I made the Almada in a knit, and will make another in woven. 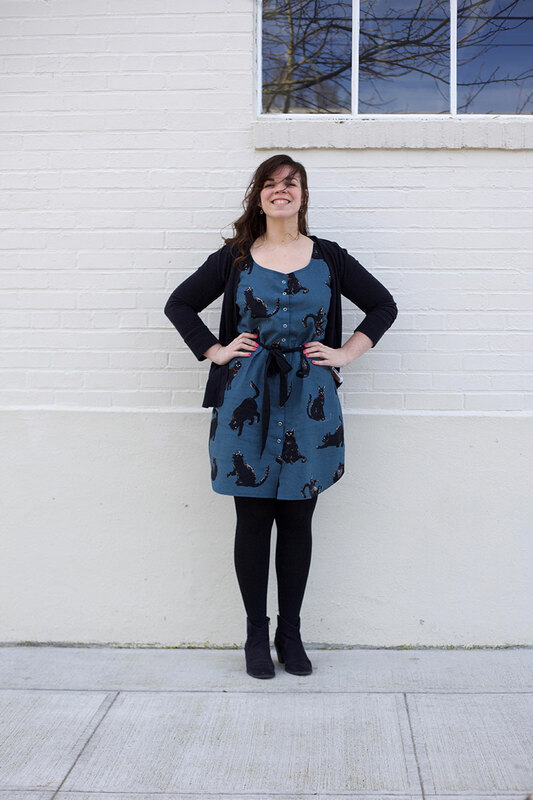 I recently finished the Mesa dress, and I actually sewed by hand using Natalie Chanin’s techniques. In fact, I sew everything by hand. I find that as I get older, I look for simpler ways of doing things, and I find that hand sewing is very relaxing. Thanks for sharing the completed projects. Love it all. I have that cat fabric with a white background! I like seeing what you did with it. I too love the look of this Merino knit dress – curious Sari whether you wore a slip or lined it or anything? I would think it’d cling to your tights. And do you find it to bag in the rear after a day of wear or does it hold up pretty well? I have most recently been sewing for others, including some pillows for my neighbor and alterations for others. Yesterday I finished a gift for my daughter in love that turned out beautifully. It is a large tote that she can use to carry and store her ice skates. It has a divider for each skate and a mesh bottom for ventilation., and I used faux leather for the outside, vinyl for the lining so it can be towel dried. I was so pleased with it that I wanted to keep it ? Now that I can focus on sewing for myself, I plan to make a few tunics with lace detailing, and a couple of purses. I love that cat fabric !! You talk me into buying the fabric and the frock pattern!! I saw the fabric at Fancy Tiger’s internet store – Thanks for the inspiration! Both of these dresses rule!!!! You both made rad dresses! Hey lovelies, Harts has already run out of Delaney’s amazing cat fabric, but I found some on Etsy by searching Cosmo fabric kitties. I feel a Kitty Akita coming on! I love both of these, especially the merino! I recently snagged some at my local fabric shop (heads’ up– if you’re in Chicago, you can get some at The Needle Shop in North Center!) and made a dress with it. It looks professional but keeps me warm in my overly air conditioned office.